What happens in the locker room stays in the locker room, as they say. But in the social media age, it’s expected that sports teams share their victories with the fans. Unfortunately for one British player, he shared a little more than he should when a candid photograph revealed a testicle sticking out of the bottom of his underpants. Middleborough smashed Sunderland yesterday 2-1 and the team was feeling great about the victory, so they assembled in the locker room to take some photos. Most of the players were still in uniform, but a few had stripped down to their skivvies – most notably midfielder Adam Clayton, pictured on the far left of the photo. For whatever reason, Clayton had pulled his left testicle out of the bottom of his briefs for the photo. 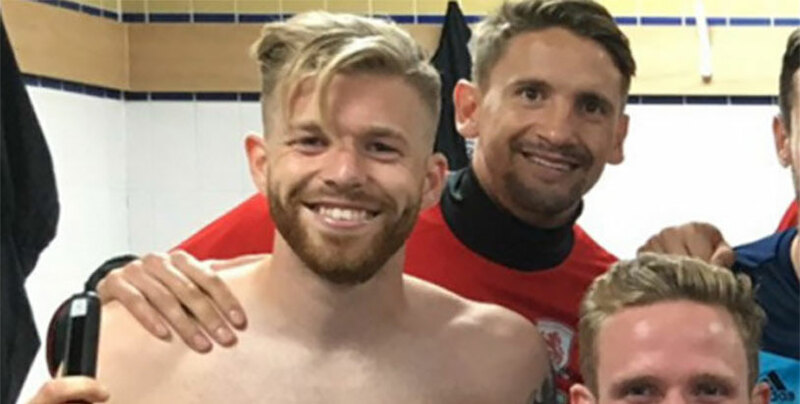 His crap-eating grin indicates that he’s fully aware of his prank, as is teammate Adam Forshaw (pictured pointing to them). The incriminating photograph spread like wildfire over Twitter, with footy fans roasting Clayton’s loose ball handling skills. Clayton hasn’t publicly commented on exactly why he thought it would be appropriate to whip his testicle out for the paparazzi, but we’d bet he’s in a bit of trouble with management at the moment.